A representative of the Loyalist Humane Society was front and centre at Shire Hall on Tuesday to ensure the incoming council understand the vital role the not-for-profit organization plays for those members of society that can’t speak for themselves. President of the LHS Gail Robinson gave an overview of the organization’s operations, how it serves the greater good and what it has accomplished in 2018. The non-kill shelter that’s based on County rd. 4 took in over 500 cats, four dogs and 18 rabbits last year while adopting 326 animals and spaying or neutering over 420 pets to help with population control in Prince Edward County. Operating thanks to the dedication of approximately 35 highly dedicated and motivated volunteers, LHS has a number of pet adoption programs and also rescue animals through partnerships with the Highland Shores Children’s Aid, the Prince Edward OPP, veterinarians and the public. The LHS also works hand in hand with the Municipality’s Canine Control and offers community hours to secondary school students, Community Living residents as well as correctional services. Robinson’s deputation came as a response to request from the Belleville-based Quinte Humane Society who came to the Jan. 10 Committee of the whole meeting to present their case for a new $10 million regional shelter and facility. 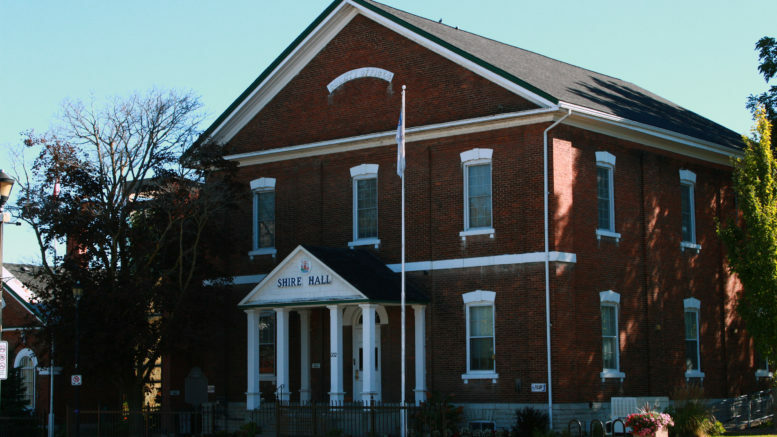 The group asked council to consider a $250,000 investment in the project as a number of northern Prince Edward County residents utilize the shelter’s services. Council chose not to bring the matter up in their budget deliberations. Councillor Bill Roberts asked Robinson what her motivation was to come to Shire Hall on Tuesday and Robinson admitted it was partly due to the presentation made by the QHS. “I think for some of the new councillors it was also important to explain who we are and howwe’ve been operating for so long in Prince Edward County. We’re not asking for monetary support but we want to make the council aware of what we do,” Robinson said. and that Prince Edward County residents and the pets and animals would benefit from this facility. “I suspect it would be good for them to have a better building but it would be good for us to have a better building as well,” Robinson answered. Robinson said she’s not opposed to QHS’ plans for a new facility in Belleville but if there were funds available from Shire Hall, she asked that they be kept closer to home. During the conversation around the horseshoe it was clear LHS volunteers had taken the time to contact members of council and bend their ears about the need for the organization and the vital role it plays in helping our furry friends. “Certainly most of the volunteers feel that way and would I not be silly not to say if there was $250,000 available we wouldn’t we like to build something? Of course,” Robinson added. In other Council news, the group made another series of appointments to local and regional boards and bodies. Water & Wastewater Rates & Connection Charges Ad-Hoc Committee- Councillors Phil St. Jean, Janice Maynard and Mike Harper. Hastings and Prince Edward Public Health- Councillors Andreas Bolik and Stewart Bailey. Picton BIA Board of Management- Councillor St. Jean. Hastings/Quinte Emergency Services Committee- Councillor Bolik. Loyalist Parkway Association- Councillor Ernie Margetson. Prince Edward County Chamber of Tourism and Commerce-Councillor Jamie Forrester. Bloomfield town Hall lower level Board of Management-Councillor Phil Prinzen. Accessibility Advisory Committee- Councillor Ernie Margetson. Cemetery Advisory Committee- Councillor Mike Harper. Agricultural Advisory Committee – Councillors Brad Nieman, Prinzen and Forrester.